The soft rhythmic drilling of woodpeckers echoed through the sunlit-dappled forest, heady with the scent of wild garlic, and the Ardingly Reservoir sparkled under a cloudless sky as four members of the Claremont Fan Court School orienteering squad lined up at the start of regional event at Balcombe in Sussex on Sunday 24 March. Spring mornings in the countryside do not come any finer than this. It was a day for enjoying the weather and the scenery to the full, and the boys made the most of it. Ellis A ran the 2.2 km Orange course solo for only the second time and finished 6th in 51:46, while squad newcomer Ellis B had a brilliant first run on the 1.7 km Yellow course to come 5th in 37:19. Thomas F made the big step up from Orange to Green, which involved a lot of careful contouring along the steep wooded slopes above the reservoir, and though he found the navigation much more challenging and took some rather roundabout routes, got round the 3.9 km course in 77:52 for 56th place. Also on Green, Nathan J made his experience tell in the tricky undergrowth and found a more efficient route to finish 24th in 53:49. 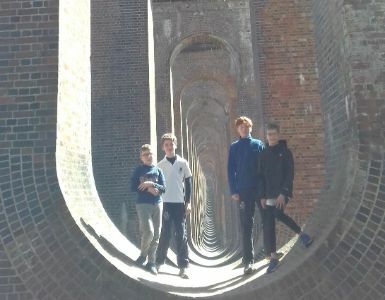 As a postlude to the event, the squad visited the nearby Victorian edifice of Balcombe Viaduct, 180 years old and hailed as the most elegant viaduct in Britain, for a photo-opportunity in the vaulting of one of its 37 arches.